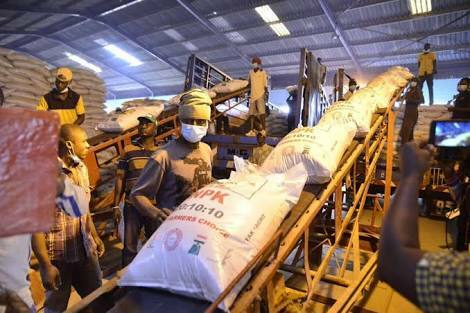 Fertiliser Producers and Suppliers Association of Nigeria (FEPSAN) says 18 fertiliser blending plants across the country have been revived under the Presidential Fertiliser Initiative (PFI) introduced by President Muhammadu Buhari’s administration. The President of FEPSAN, Mr Thomas Etuh, who said this in an interview with NAN in Abuja on Tuesday, stressed that the resuscitated plants were now operational. He recalled that only six, out of the 32 fertiliser blending plants existing in the country, were functional at inception of the Buhari-administration in 2015. “We then had six fertiliser plants working at 10 per cent capacity but with the introduction of PFI, we moved to 11 plants in the first phase and today, 18 out of the 32 plants are engaged in this programme. “At the end of last year’s season, we closed with 12 fertiliser blending plants because WACOT Limited, in collaboration with the Edo State Government, added one plant to the 11 we had in the first phase. “About five plants are being evaluated to meet up the standards before we enlist them, and I can also tell you that because of this programme, we have five new fertiliser blending plants being set up in the country. “We have one each in Zamfara, Ajaokuta in Kogi, Akwa-Ibom and Funtua in Katsina State, while the one in Kaduna is at the point of inauguration. “The plants in Ajaokuta (Kogi) and Zamfara should come live by the end of the year, while that of Funtua in Katsina State might come up by first quarter of next year (2019). “So, I think these new five plants should be up and running by the first quarter of next year,’’ he added.